This week I’m combining my love of writing and teaching through play to facilitate a writing camp for kids in St. Paul, Alberta. The St. Paul & District Arts Foundation is offering Compose Your Summer, four days of literature and dance. Miss Heather is facilitating the dance and I’ll facilitate the writing portion. Challenge: Draw a giant map or picture of your story world using crayons, markers, paint, or whatever else you choose. Think about what your world is like, who lives there, and how your characters work together or against each other. Challenge: Explore costumes and figure out what your main character looks like. Draw a picture of your character and/or fill out a character questionnaire. Then interview a fellow camper and find out about his or her character. If you’d like, you can act out your character and we’ll capture him or her on video. Challenge: Explore the senses and create a sensory dictionary as a group. Go through your story and highlight each sense with a different colour. Discuss self-editing tips as a group. Exchange stories and give feedback. Work on revisions. I’ve found an amazing array of resources on writing and teaching writing to children to include as handouts for each participant. Ruth, this looks wonderful. 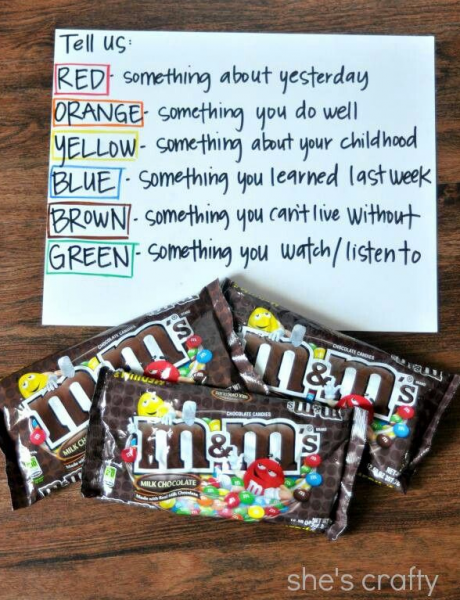 I love the M and M’s idea!